236 pages | 65 B/W Illus. Adaptive survey designs (ASDs) provide a framework for data-driven tailoring of data collection procedures to different sample members, often for cost and bias reduction. People vary in how likely they are to respond and in how they respond. This variation leads to opportunities to selectively deploy design features in order to control both nonresponse and measurement errors. ASD aims at the optimal matching of design features and the characteristics of respondents given the survey budget. Such a goal is sensible, but ASD requires investment in more advanced technical systems and management infrastructure and asks for the collection of relevant auxiliary data. So what are current best practices in ASD? And is ASD worthwhile when the same auxiliary data are employed in the estimation afterwards? In this book, the authors provide answers to these questions, and much more. "Adaptive Survey Design is a mathematically rigorous discussion of a new set of tools for managing surveys more efficiently, written by three of the world’s leading experts on these tools. Surveys around the world face growing challenges—higher costs, lower response rates, use of mixed modes of data collection—and adaptive designs have emerged as one response to this more difficult climate. 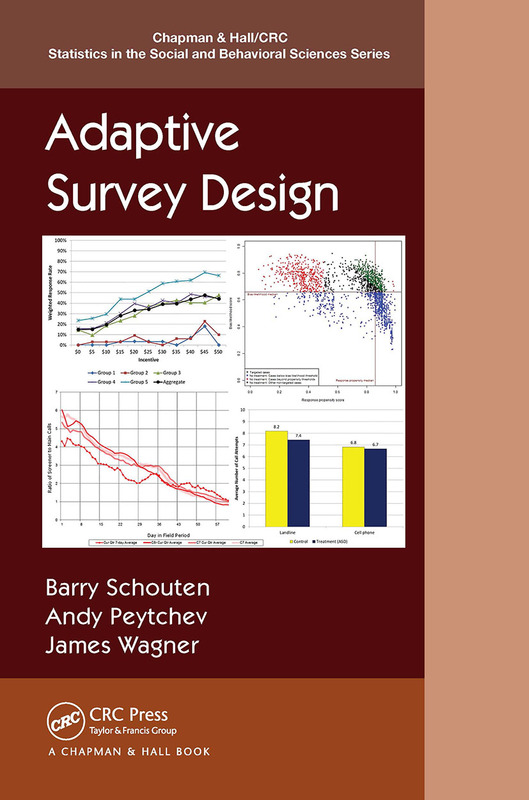 This book presents a thorough explanation of adaptive survey design and makes a convincing case for the value of such designs. The book represents an important contribution to the literature on survey design. " "This book will be an invaluable resource for survey managers, survey statisticians, and survey methods students. It is set to become the landmark text on adaptive survey design. While adaptive designs have come of age and are now being used or tested by many survey agencies, there has been a lack of clear or consistent guidance. This book provides just such guidance, while also being refreshingly honest about aspects that still require more research. The practical experience of the authors shines through, particularly in the case studies. These, and the simple summaries at the end of each chapter, should prove most useful to anyone wanting to implement an adaptive design of their own. This book is a very useful addition to the survey methods literature." "This is the first comprehensive book that is dedicated solely to such designs and I have no doubt that it will become the authoritative book on the subject with a lasting legacy effect. The book culminates many years of research by the authors with their colleagues and co-authors, and is a one-stop source for those interested in implementing such designs. It is a valuable up-to-date and accessible resource for both statisticians and survey practitioners. The statisticians will benefit from the mathematical and theoretical rigour and the survey practitioners will benefit from the many examples and applications of such designs. The book highlights the need for statisticians to become more involved in the data collection activities and work together with survey practitioners to improve the quality of survey response in the era of declining response rates. Given new forms of data sources and Big Data that are increasingly being used in social research, there is more pressing need to ensure that random surveys have high quality and representative response so that they can be used to correct sources of bias arising from non-random data sources. The theoretical and intuition of adaptive survey designs is clear and concise and the applications include real examples that are illuminating and practical in many other settings. Overall, the book is exceptionally well written and will be a major reference book in my collection." "The landscape of survey data collection is always changing, and this leads to new opportunities and challenges. Over the years, however, nonresponse has always been an important problem that affects the quality of the survey outcomes. Response rates are even decreasing, making problems still worse. This calls for a drastic new approach. This book offers this approach. It focuses on increasing the response propensities of those with low response propensities. This reduces the bias of estimates. The authors describe a new approach of organizing the fieldwork, in which not every sample person gets the same treatment. Adaptive Survey Design is an important, novel approach for survey research. It is an important book for those involved in survey data collection. It is about quality and costs. An attractive aspect of the book is that it describes both theoretical and practical aspects. There are useful practical examples. We are in the hands of well-known experts who have many years of experience in survey methodology." What is an Adaptive Survey Design? Andy Peytchev is a research assistant professor in the University of Michigan’s Program in Survey Methodology and the Joint Program in Survey Methodology at the University of Maryland. Barry Schouten is senior methodologist at Statistics Netherlands and professor at Utrecht University. James Wagner is research associate professor in the University of Michigan’s Program in Survey Methodology and the Joint Program in Survey Methodology at the University of Maryland.